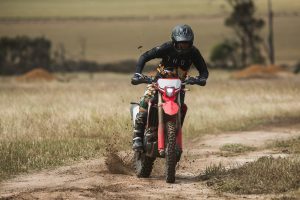 MotoOnline.com.au tests the 2019 Honda CRF450L. 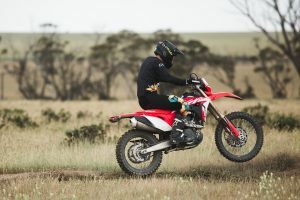 One of the most highly-anticipated releases across a wave of new models, the 2019 Honda CRF450L has struck the interest of many as Honda repositions itself as a strong contender in the enduro and dual-sport market. Based off the race-winning CRF450R, the L edition is very much its own bike, boasting a number of exclusive components tailored for blasting through trails, ripping up hills and even commuting the streets. 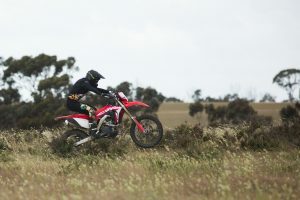 Delivering a mix of a competitive enduro machine and user-friendly characteristics, Honda has found a unique balance that’s set to make the CRF450L a common sight. We were invited to sample the 2019 Honda CRF450L at West Moto Park in Wyalkatchem, Western Australia, approximately two hours from Perth. 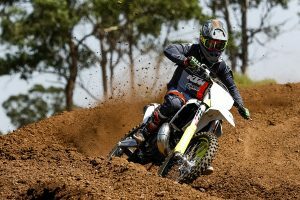 The extended ‘pro’ track we rode consisted of mainly single line and trail, which proved to be the prefect testing grounds as it delivered a mix of loam and hard-packed sections. 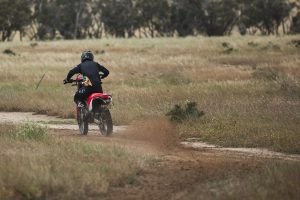 A few showers of rain made things a touch on the wet side, although the soil was able to soak most of the moisture, creating ideal riding conditions. As mentioned, the CRF450L is based off the R model and benefits from a lot of its competitive characteristics, although it still packs its own technical features. 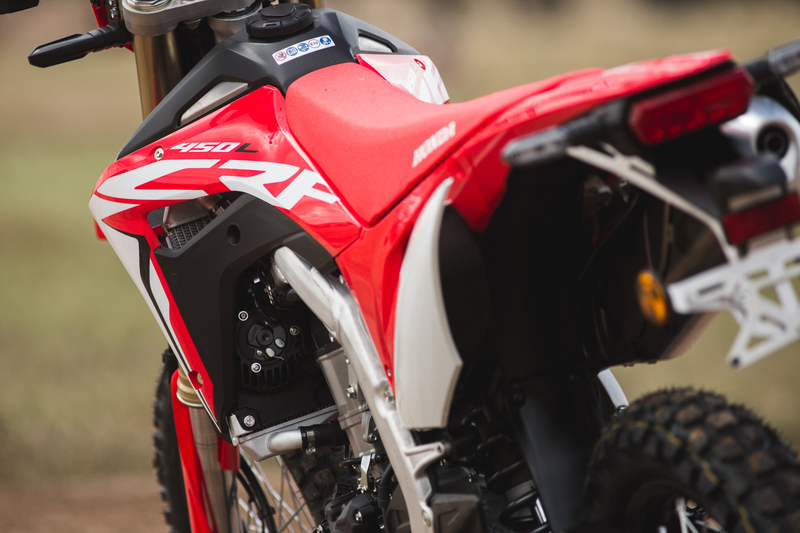 The plastics are lifted directly from the CRF450R and all lighting is LED, with the front headlight in particular throwing out a penetrating beam. 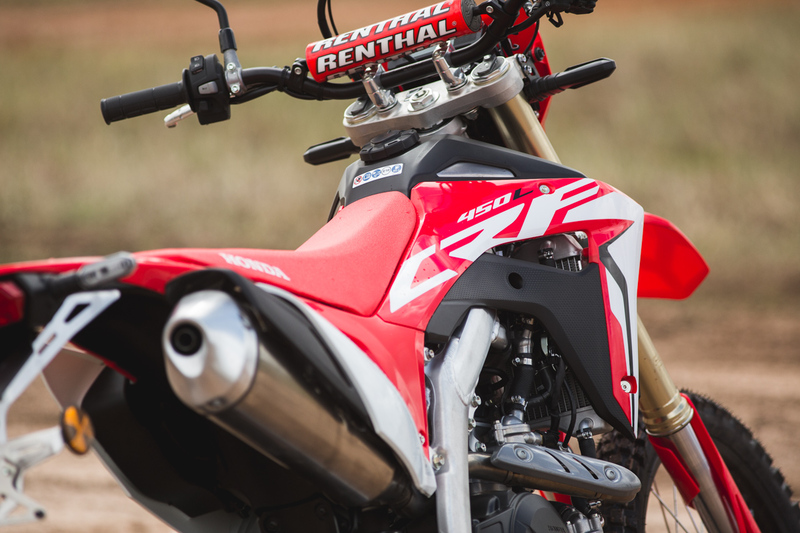 Increased volume for the titanium fuel tank adds range and all the items that make the CRF450L ready to purchase as a licensed, road going LAMS-approved machine – such as speedometer, horn, indicators and mirrors – are standard. 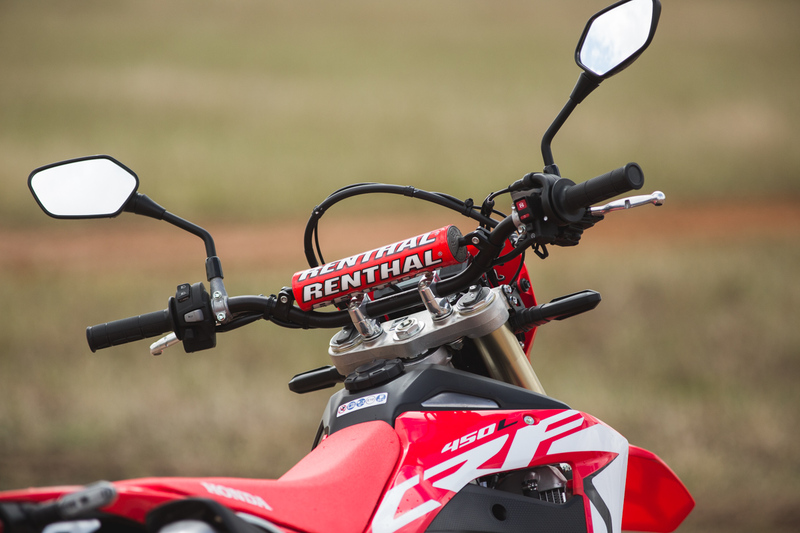 Both fuelling and ignition maps are now managed by an 02 lambda sensor, and the compression ratio has been lowered and crank mass increased for improved drivability. The gearbox is a six-speed – which comes in handy for those planning on hitting the highway – and a cush drive has been added to the 18-inch enduro-spec rear wheel. To assist with a smoother ride and reduce noise, the aluminium swingarm has been injected with urethane. A 260mm wave-pattern disc delivers effective heat dissipation, power and feel from the two-piston brake calliper working it at the front, with a a matching 240mm wave-pattern disc and single-piston calliper is at the rear. Boasting a 449cc single-cylinder engine, the Honda CRF450L delivers an incredibly smooth and manageable power delivery. 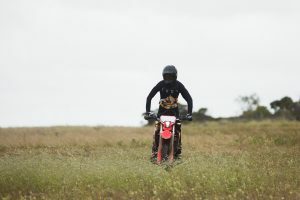 It’s one of my favourite characteristics about the motorcycle – the bike is so easy to ride, yet has enough power on tap if I wanted to step things up a notch. 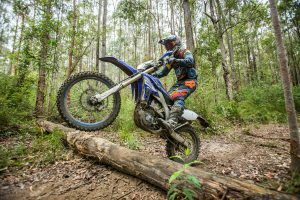 It’s user-friendly nature is a really appealing aspect, especially if you’re a more road orientated rider looking to dabble in the dirt. Don’t be fooled though if you’re considering the CRF450L to be your enduro weapon of choice – while the power delivery is manageable and friendly, it has an endless amount of torque that continues to pull from bottom to top. 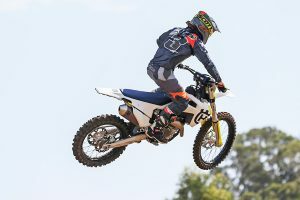 The usual modifications such as an aftermarket exhaust and re-mapping to suit will really open up the engine and give it a more aggressive feel of power, which would be ideal for racing. The CRF450L is fitted standard with a European-spec ECU that allows the bike fit into the LAMS category, although this ECU offers an even more mellow nature of power. Fortunately, if you’ve got an open licence or aren’t intending on taking the bike on road, then Honda is offering a genuine ECU for purchase that aligns with the US-spec model. I was able to ride with both ECUs, and the difference is noticeable, however the standard, more mellow unit still felt very capable. 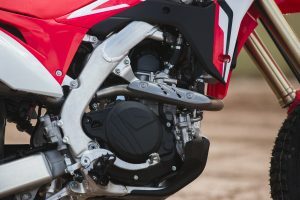 While the fundamental construction of the four-valve Unicam powerplant remains the same, many details have been changed to support the broader role that this bike is targeted at, such as the the crank’s mass being increased, resulting in 13 percent more inertia, which is improves the torque feel and response. The gearbox is now six-speed, rather than five, for longer range use on the road. The CRF450L utilises the tapered dual-spar aluminium beam frame from the R model, although it’s been made slightly wider at the swingarm pivot points to allow for the greater engine width that comes as a result from the six-speed gearbox. The bike itself feels incredibly slim, making it nice and nimble while also allowing me to lock my legs in tight. 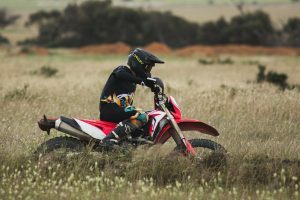 The ergonomics really promote sitting up front and putting your leg out around turns – it just felt so natural to tip the bike over in corners, regardless if it was flat and hard-packed, or banked and loamy. The cornering of a motorcycle is one aspect that I hold in high-regard, and the CRF450L excels in this department – without making any adjustments to the suspension or chassis, the bike went exactly where I wanted it go and tracked beautifully around the flat turns. 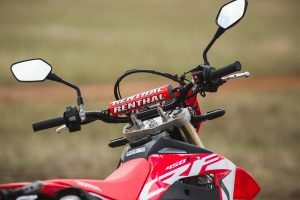 The fully-adjustable suspension, which consists of 49mm Showa fork and Showa shock, was touch on the hard side for my 75-kilogram frame, although a simple play around with the clickers would solve that issue. 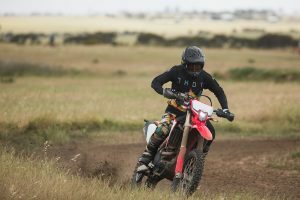 Still, it managed the jumps, corners and obstacles with ease, and kept in shape through more challenging sections such as whoops and rollers, which was quite reassuring and confidence inspiring. 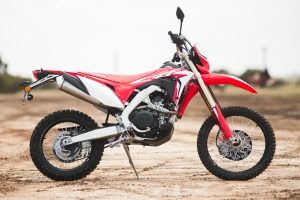 Riding the 2019 Honda CRF450L left me wanting more, the bike itself was so enjoyable ride and made for extremely satisfying day – it’s exactly the feeling I desire hopping off a motorcycle. Being such a versatile motorcycle in that it can be a competitive and capable racing weapon, or a user-friendly machine for bush-bashing on the weekends, make this bike a clear favourite in the market. The ability to take it in whichever direction you want is highly valuable, and the 1000-kilometre service intervals backed up with 32,000-kilometre intervals between major strip downs only enhances its attractiveness as an enduro and dual-sport motorcycle.